Flood alleviation schemes are the most high profile of the Department's work as we construct flood walls, banks and other flood management measures to reduce flood risk to homes and commercial property which have been identified as being at significant risk. It is currently estimated that in Northern Ireland some 46,000 properties are located within natural river and coastal flood plains. Nearly a third of these properties are within the greater Belfast area. This means 1 in 18, are currently at risk from flooding from rivers or the sea. Another 28,000 properties are at risk of flooding from reservoirs and tens of thousands at risk from surface water. Protecting these properties is a key priority for the DfI Rivers. We do this by building new flood defences and maintaining existing structures. This year (2013-2014) some £6m will be spent on flood defence schemes. You can get more details on some of the major schemes from the menu on the left. Work is well underway on the £11m flood alleviation scheme in East Belfast. It is the biggest project on the DfI Rivers' capital programme. The flood defences along the Knock, Loop and Connswater Rivers, will reduce the risk of flooding to 1,700 homes and businesses. The East Belfast area suffered significant flooding in June 2012 due to heavy rainfall. This new work will provide protection from a 1-in-100 year flood, (ie a flood with a one per cent chance of occurring in any single year) as well as national standard of protection from flooding from the sea. The DfI Rivers brought forward the flood protection proposals to coincide with the development of the Connswater Community Greenway. A £32m investment which will create a 9km linear park following the Knock, Loop and Connswater Rivers. The park will create a safer, cleaner and greener public space, whilst connecting people and places. It is envisaged that this joint approach will deliver substantial cost savings combined with reduced disruption to the community and environment. You can view more details on the scheme by visiting the Community Greenway website. East Belfast has the largest area of flood risk (from rivers and the sea) currently being addressed through capital works in Northern Ireland. The £11m East Belfast Flood Alleviation Scheme is being delivered jointly by DfI Rivers and Belfast City Council in a number of stages; it will provide enhanced protection for some 1,700 properties from sea and river flooding. Properties close to the Loop and Knock Rivers and the Connwater will benefit from the river works as will low lying properties in Sydenham which more at risk from extreme tidal flooding. The risk to people and property has become more evident due to the exceptional rainfall and flooding in Belfast in June 2012 and property has been further threatened during the more recent coastal storms in January 2014. The East Belfast Flood Alleviation Scheme consists of, integrated and ‘stand-alone’ flood alleviation works elements. The ‘stand-alone’ elements of the East Belfast Flood Alleviation Scheme valued at £3m, are being delivered by DfI Rivers through contractor, Fox Building and Civil Engineering. These are flood alleviation works which do not require integration within Greenway’s environmental improvements and mainly comprise river culvert upgrades and new flood defence construction undertaken in the Castlereagh Road, Ladas Way, Grand Parade, Clara Park, and Montgomery Road areas of East Belfast. Works commenced early in 2014 and are progressing satisfactorily with completion programmed late 2015. The integrated elements of the Scheme are being project managed and delivered through Belfast City Council’s Connswater Community ‘Greenway’ project. Here flood alleviation works and ‘Greenway’ environmental improvements are being constructed together in an integrated fashion. The flood alleviation elements are estimated to cost approximately £8m. Phase 1 of the ‘Greenway’ in Orangefield and Victoria Parks is now largely complete and is being constructed by BSG Civil Engineering of Magherafelt. Phase 1 included re-routing of the Knock River through Orangefield Park to provide improved flood protection to adjacent properties and to develop the river as a key environmental feature of the park. The final and more extensive Phase 2 has been tendered and awarded to Farrans (Construction) Ltd. Works which will take place on reaches of the Connswater and Loop River are due to commence later in 2014 and are programmed to be completed during 2016. Construction of a £1.35m Flood Alleviation Scheme for the village of Beragh, County Tyrone is currently underway. The works will reduce the risk of flooding to 20 properties within the village at 4 separate locations. In August 2008 and October 2011, severe flooding caused damage to domestic properties and the Gaelic Athletic Club in the village. Works commenced on site late April 2014 and are progressing in accordance with the construction programme with expected completion within a year. The scheme involves the construction of approximately 900m of flood defence comprising of steel sheet piles, reinforced concrete and masonry structures. The works also involve the installation of back drainage, rock revetment to the existing river bank and fishery enhancement measures. Works are progressing on site with sheet piling completed for three of the four sites. Concreting works follow the sheet piling and these works are progressing well with the flood wall practically complete at one location. Bank revetment works along the river are also complete. Minister Michelle O’Neill has visited St Ciaran's College, in Ballygawley to inspect the new £1.5m flood alleviation scheme which will provide enhanced protection to the school and local properties in the County Tyrone village. The scheme provides improved protection against river flooding for many residents, business owners and St Ciaran’s College, in the County Tyrone village. The work provides a high level of flood protection to the properties which have, in recent years, experienced flooding resulting from heavy and prolonged rainfall. The work started in early 2013 and took almost a year to complete. The project included the construction of flood banks and 1 kilometre of flood walls at key locations along the Ballygawley River. As well as the enhanced flood protection work, DfI Rivers worked in partnership with DfI Roads and NI Water to replace the Tullybryan Road Bridge, a culvert on Richmond Lane and upgrade storm sewers adjacent to the river. In conjunction with DCAL Inland Fisheries, a substantial fisheries enhancement scheme will be implemented as an integral part of the Flood Alleviation Scheme. Measures will also be put in place to minimise the impact of the works on the environment and local communities. Any additional opportunities for environmental enhancement will be considered as they arise during the construction program. 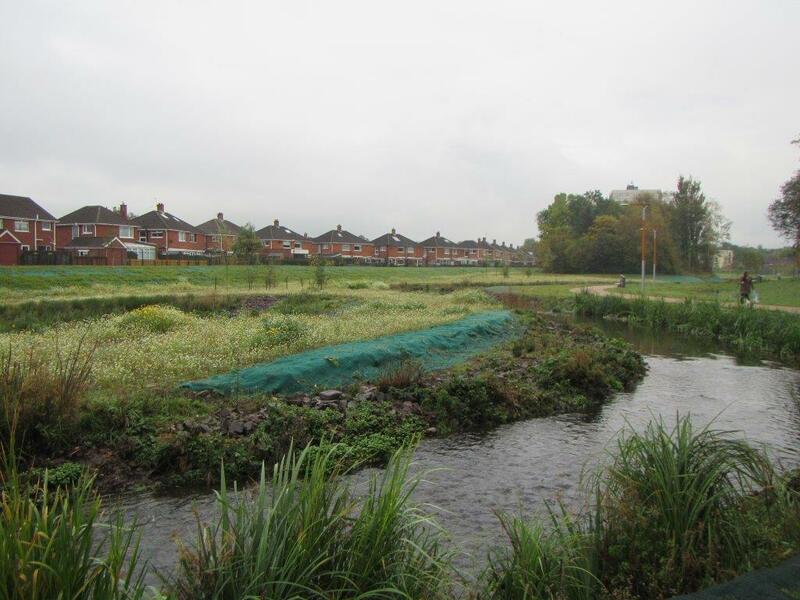 DfI Rivers has completed construction of this £125K flood alleviation scheme in Annsborough, Co Down. This included some 315 metres of flood walls and flood banks to alleviate flooding. A major flood event occurred on 16 August 2008 when the Leitrim River broke it banks upstream of the Annsborough Park development, which lies at the bottom of a valley, and cascaded downstream causing flooding to the Feedwell Animal Foods Factory and 20 homes. The 19km watercourse, which is also know at Ballybannon River, rises in the hills above the village of Dromara at Slieve Croob and flows in a south-easterly direction, discharging into Dundrum Bay. The sluice gates at Portna are essential for controlling water levels in the Lough Neagh Lower Bann river system and the related navigation. DfI Rivers has recently overseen a maintenance project on the gates to enhance their life expectancy by 15 to 20 years. The 4 gates, which were erected in the 1930's, are raised out of the water and painted using specialist metal-work paint which is resistant to the water environment. The Department for Infrastructure (formerly Department for Agriculture and Rural Development), would from time to time issue public notices, in pursuance of Article 12A (3) of the Drainage (Northern Ireland) Order 1973 (as amended) that it proposes to carry out a drainage scheme or works in a specific location.